The AM-200 is the latest amplifier we offer that fits the requirements for smaller environments. Too often, your only options were high-powered systems that are just excessive for your dorm room or apartment. Essentially purchasing a system you would never fully utilize. Smaller speaker systems just would not offer the same sound quality you're looking for. This amplifier will bring optimum sound to your party! 5.12" x 17" x 12.6"
16.9" x 14.6" x 6.1"
The Acesonic SP-450 Professional Karaoke Speakers are designed with serious singers in mind. 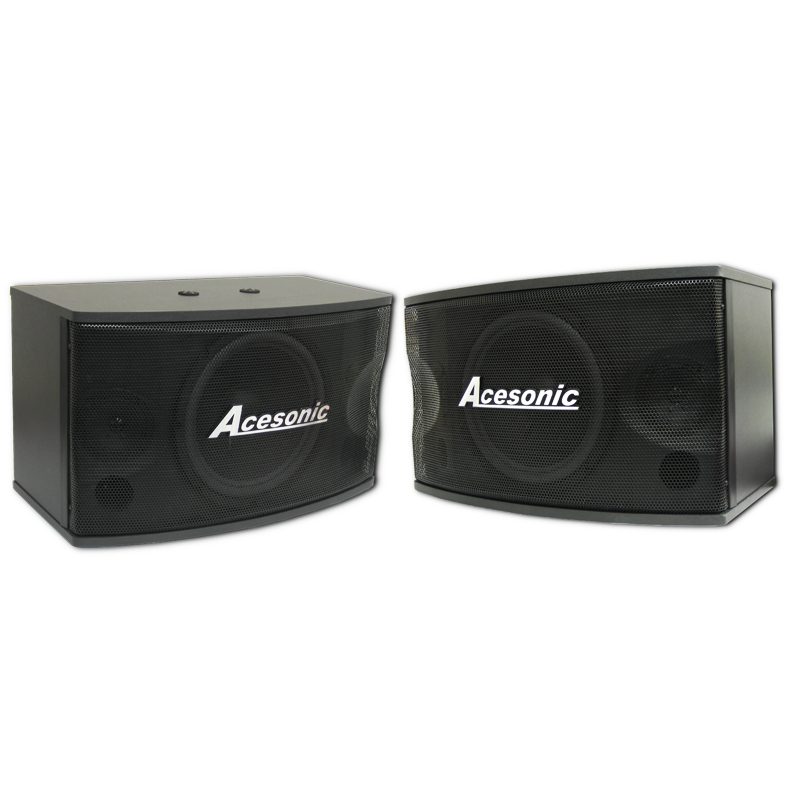 The Acesonic SP-450 is a bass reflex professional karaoke speaker that dishes out surprisingly rich, full sound for the mid-range. It takes advantage of the latest technology geared towards professional and home karaoke! The 10" woofer and two 3" tweeters provide smoother response and better detail than other speakers of the past. And these speakers don't just sound great; with it's solid black color and three dimensional curved design, these two speakers will look great in any club or home! Frequency Range: 55Hz-20kHz Rated Sensitivity: 90dB Max. What is a bass reflex speaker? Unlike an acoustic suspension speaker that uses a sealed enclosure, a bass reflex speaker includes a port (a hole in the box tuned to a specific frequency) or bass radiator (often referred to as a "drone cone") to produce more bass output in a tuned frequency range. With a bass reflex design, efficiency is better - a bass reflex speaker will play louder than an acoustic suspension speaker when driven with the same amount of amplifier power. 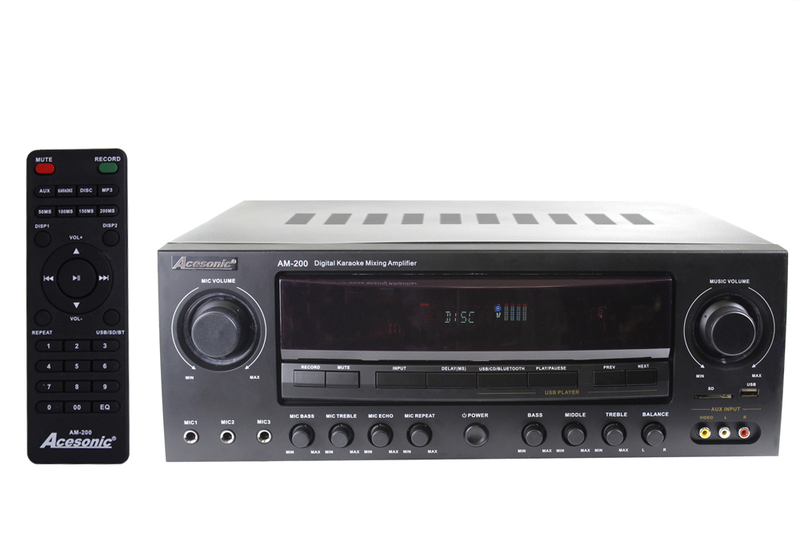 This can be a big benefit, especially if you're using a low-powered receiver or amp. 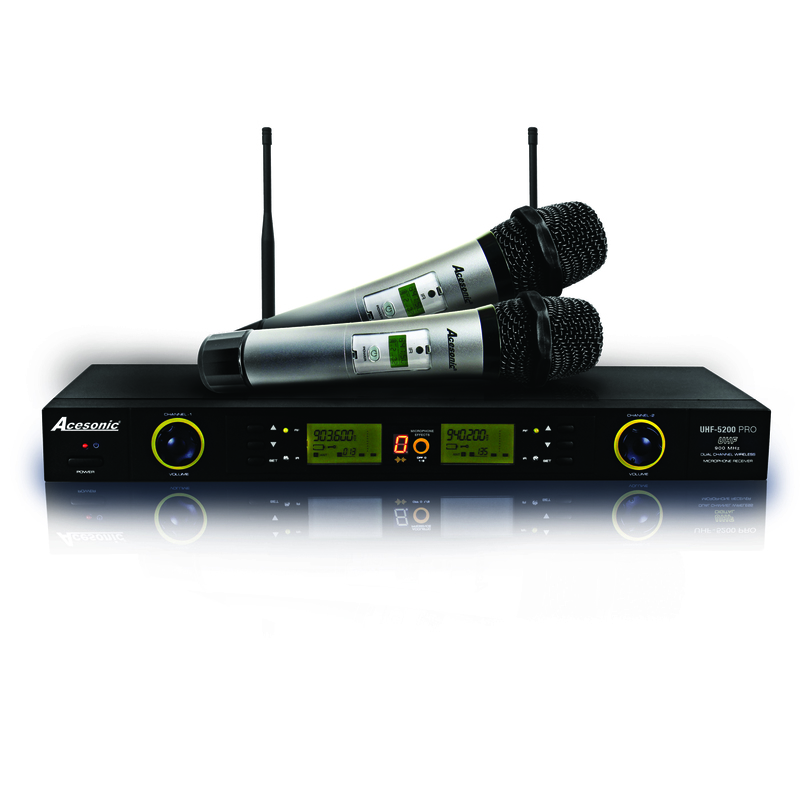 The Acesonic UHF-5200 Pro is a True Diversity, 900MHz Dual Channel UHF Wireless Microphone System. This system operates in the 900Mhz range which goes even further up the UHF spectrum to interference. Most common systems operate in the crowded 600 and 800MHz range so the UHF-5200 Pro effectively avoids interference and frequency traffic jams with other systems. Excellent sound quality is provided by commercial grade UHF true diversity where 2 radio modules per antenna are continuously compared to select the strongest signal which delivers exceptionally stable radio signal. If you run into some interference, just select another channel from the many available. The microphones will auto-sync with the receiver via infrared. These two features combine to provide you with a very robust system. The microphones themselves are designed to pick up your voice very well so you always sound like yourself and don't have to worry about sound degradation. After many uses, most microphones do get dropped a few times which is why these are built a lot more rugged than others. 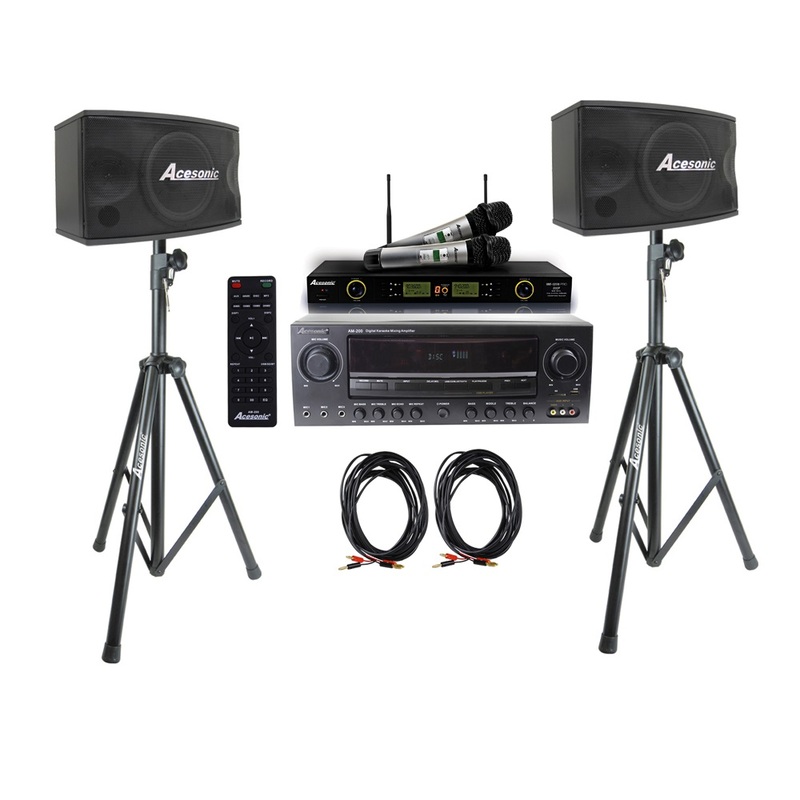 Acesonic has developed this system to perform very well with emphasis on sound and build quality. There are 8 different sound effects to choose from to help enhance your sound. Make your choice depending on your music type like Pop, Rock, Classic, Jazz, Dance, or R&B. Other effects can match your sound preferences such as Boost or Treble. Standard settings are available for those who want no effects or prefer to use their own EQ.